This second edition emphasizes collaboration within healthcare institutions, professional organizations, and government for the development of policies from bedside to boardroom. 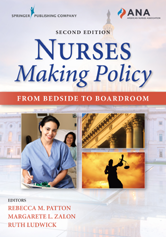 Using descriptive cases, the book delves into the growing role of nurses in elected and appointed office. 5. Harnessing Evidence in the Policy Process - White Kathleen M. and Rankin Audra N.
6. Setting the Agenda - Groah Linda K. and Hader Amy L.
12. Evaluating Policy: Structures, Processes, and Outcomes - Clarke Sean P. and Linzer Pamela B. 13. Eliminating Health Inequities Through National and Global Policy - Williams Shanita D. and Phillips Janice M.